Are Prenuptial Agreements Enforceable in Quebec? 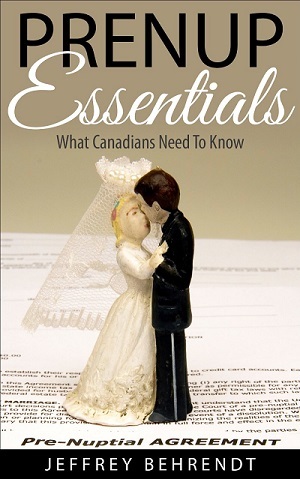 Marriage contracts are governed by section 52 of the Family Law Act in Ontario. This section gives statutory authority for people who are or will be marrying to enter into a prenup that sets out their rights and obligations to each other during their relationship and when their relationship ends. The section also states that certain rights regarding the matrimonial home cannot be dealt with in a prenuptial agreement. The situation in British Columbia is quite complicated as family law legislation is in the process of being amended. Currently, family law is governed by the Family Relations Act which does not cover common law couples in BC. However, the Family Law Act, which received Royal Assent on November 24, 2011 is scheduled to take full effect 12 to 18 months after this. The Family Law Act will apply to couples who live together for two or more years. As a practical matter, this makes it very likely that it applies to couples currently in common law relationships, as even if the relationship ends, a partner can simply wait until the new act is in effect and then take advantage of its provisions. Under the British Columbia Family Law Act, cohabitation agreements are covered in sections 92 and 93. Section 92 states that couples are allowed to enter into agreements in which they divide property and the property can be divided or valued differently than required under the Act. Section 93 sets out the circumstances in which a court can invalidate the agreement, and these include the standard failing to dislose information, taking advantage of a partner’s ignorance, vulnerability, distress or need, or a partner not understanding the agreement. The section further goes on to state that if an agreement is signficantly unfair, then a court may set it aside. Sections 37 and 38 of the Matrimonial Property Act of Alberta are the provisions that govern a prenuptial agreement. The Matrimonial Property Act does not apply to cohabiting parties but the considerations for a cohabitation agreement are similar to those for a prenuptial agreement. In Manitoba, property division is dealt with in the Marital Property Act. A prenup in Manitoba is considered a type of spousal agreement, which is defined in section 1(1) of the Marital Property Act. Section 5 of the Marital Property Act specifically allows spousal agreements to exclude the operation of all or part of the Marital Property Act, for all or part of a couple’s marital property. In Saskatchewan, section 38 of the Family Property Act allows couples to enter into interspousal contracts. Generally, a prenuptial agreement made in any province or territory other than Quebec will be enforceable in any other province or territory other than Quebec. However, as most people know, Quebec has a different legal system than the rest of Canada. So, the question arises, is a prenuptial agreement made in a province or territory other than Quebec, enforceable in Quebec? This is particularly important where I live, in Ottawa, as people often move from Ottawa to Gatineau and vice versa. So, this means that in Quebec, the validity of a prenup will be governed by where you live at the time you enter into the agreement. So, an Ontario prenup will be valid in Quebec if it is valid in Ontario. If you and your spouse lived in different provinces at the time of marriage – for instance, if one of you lived in Ottawa, and the other in Gatineau – the domicile is the law of your first common residence. So, in this example as long as you and your partner initially live in Ontario rather than Quebec, this means that an Ontario prenup would be valid in Quebec. The family patrimony consists of the all residences (i.e not just a home but also including a cottage, etc. ), furnishings, family cars, and retirement plan rights accrued during the marriage. So, essentially anything used by the family, plus pensions/RRSPs acquired during the marriage. Anything else, such as investments, bank accounts, items just used by one party, such as tools, profit sharing plans, pension plan rights accrued prior to marriage, gifts, inheritances, etc., is not included in the family patrimony. So, in short, assets that are included in the family patrimony would be divided by Quebec law regardless of what the prenup said, and the remaining assets would be divided according to your prenup. I wish to get married to an Iranian citizen who lives in UK. Currently, I work in UK and I am Canadian citizen. I have a property in Canada. I want to bring her to Canada later in the next two years. But I wish to know when we move to Canada, and we live in my property, in case we ever get divorce, will my apartment be considered a Matrimonial Home and therefore, I need to have a prenup if I wish to keep that for myself in such occasions. @Alireza – Yes, that is correct. You should also consider consulting a solicitor in the UK as they family law regime there is quite different than in Ontario. In BC if a women received an insurance settlement from an automobile accident ($175K remaining) to help pay future living costs – and years later got married, could the other spouse make a claim for half of the amount then remaining if they divorced? Would a prenuptial agreement specifically covering this matter be needed to protect the insurance settlement, or does legal precedent do that? Hello I am getting married on March 14, 2014 and would like to have a prenuptial agreement done. I own property in Alberta that I want to protect, I don’t want to assume his debts going into our marriage and be indemnified against future debts he incurs on his own during our marriage. My plan is to keep all of my current bank accounts and credit cards separate and to keep our current budget/receipt tracker going. What are the typical costs to have an agreement drawn up? Hi. I live in Manitoba. Moved in with boyfriend a year ago. We both have legal wills which were done prior to co-habitation which clearly designates any of our individual funds/belongings will go to our own children upon either of us passing on. Is a pre -nup agreement required? @Darlene – Wills deal with the situation where one passes away. Prenups can deal with that situation too, but generally deal with the situation where partners separate.